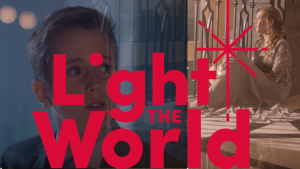 For this music video Light the World, LDS composer Sara Baril and her son Benson Baril teamed up with America’s Got Talent finalist Evie Clair with an original song that captures the heart of the #LIGHTtheWORLD celebration to teach, serve, and love as Jesus Christ. Each person is searching for light. Each person is a light. Learn how you can help share the message “Light the World” this Christmas. Sara and Benson traveled from their home in Canada to record and film this music video in collaboration with Step UP Schools, Mormon.org, and the Salvation Army. They put their words into action as they participated in service projects, including preparing food boxes and hygiene kits for families in need and reading to and playing with the students. Light the World sheet music available here.